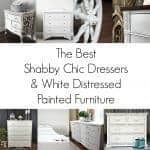 Shabby chic often makes me think ‘white’. But it doesn’t have to. 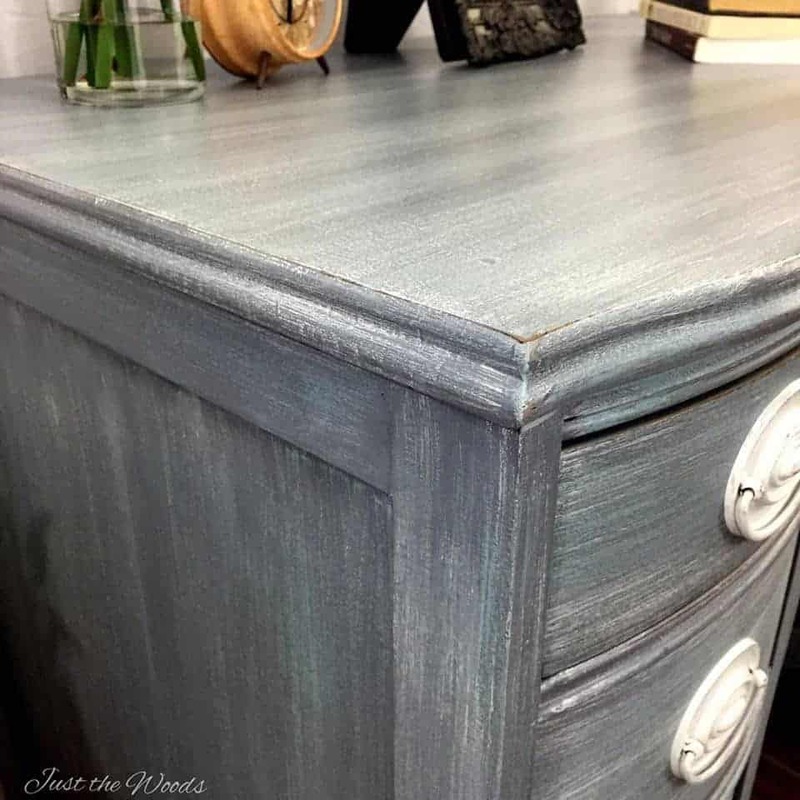 This hand painted shabby chic desk makeover has more layers than you could ever imagine! 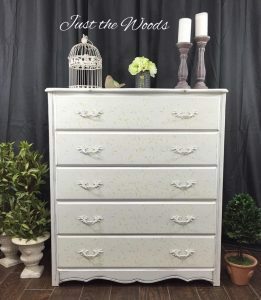 It’s Hepplewhite style with awesome oval hardware, an abundance of dovetail drawers and lovely subtle curves add to the beauty. 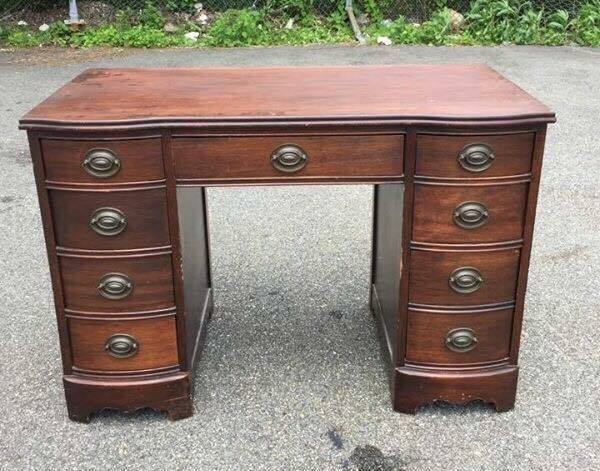 This vintage Hepplewhite style desk has great ‘bones’ and tons of potential with no major damage. 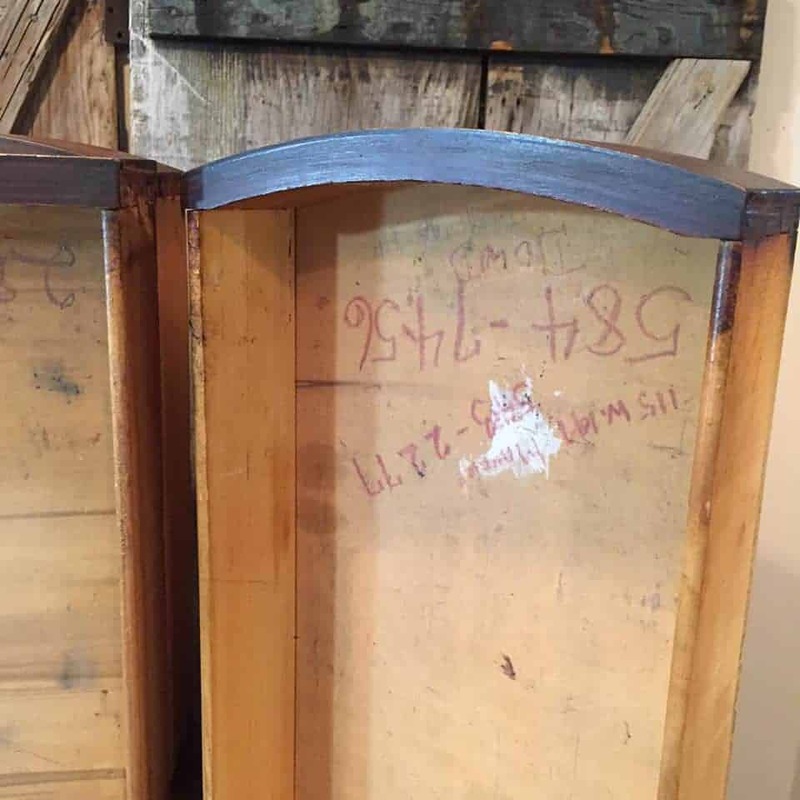 One thing about old furniture is the history. They all have it, some are just more outspoken about it. 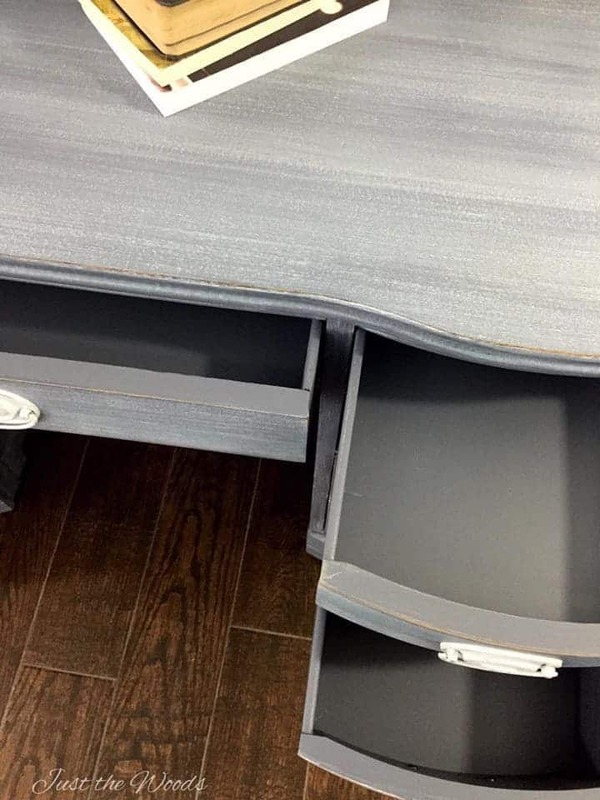 This desk had phone numbers written inside the desk drawers. Some sort of who knows what stuck in the drawers had to be scraped off with a straight razor. 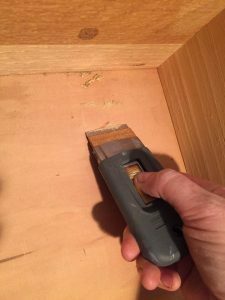 The entire piece was hand sanded and thoroughly cleaned prior to starting. 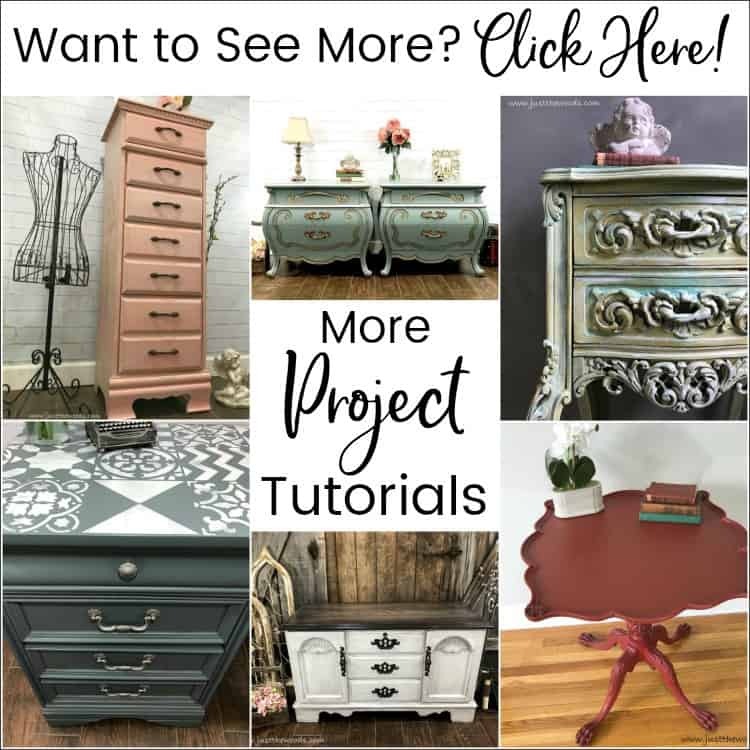 This is my standard process of How to Prep Painted Furniture. A base coat of gray started off the madness of my layering. 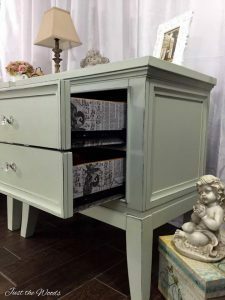 You can find great paint options online HERE. Followed by layers upon layers of grays, whites and a hint of blue. 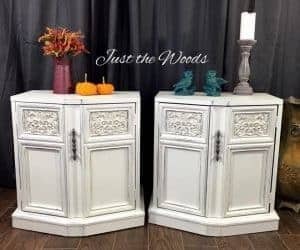 This is the same exact technique as in the Painted Pineapple Pedestal Table. 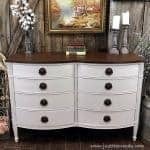 The hardware was cleaned and refreshed to a distressed shabby chic white. This is How I clean, prep and paint hardware. 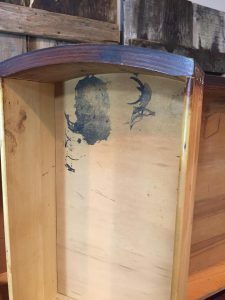 Inside the drawers were painted a solid gray, covering up and hiding any proof of the previous life that this piece once had and preparing it for its next life phase in a new home. 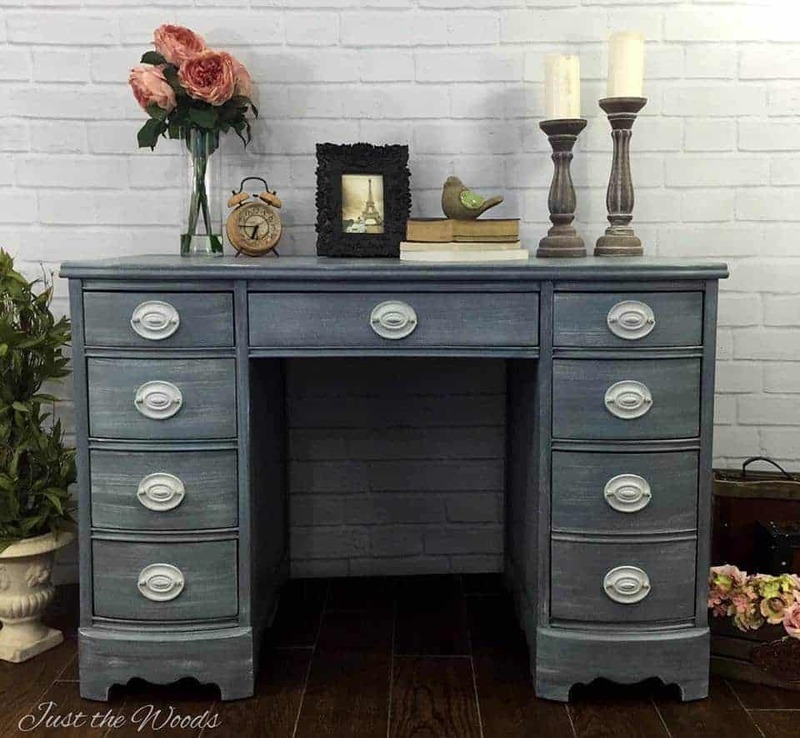 This vintage desk was distressed and sealed for protection in all its shabby chic glory! 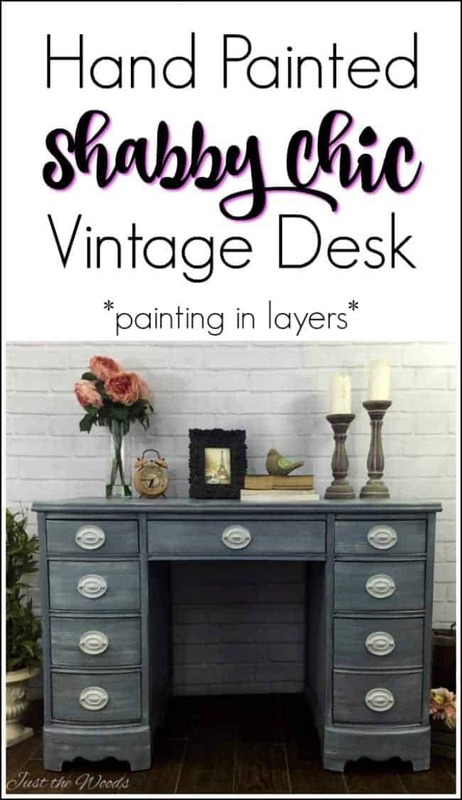 For more fabulous desk makeovers make sure to check out Ten Amazing Vintage Desk Makeovers. Beautiful! How did you add the layers of paint, was it dry-brush? The painting technique you used would make an awesome tutorial. Love this transformation. Turned out beautiful. This piece is beautiful! I love the layered look and you pulled it off so well! 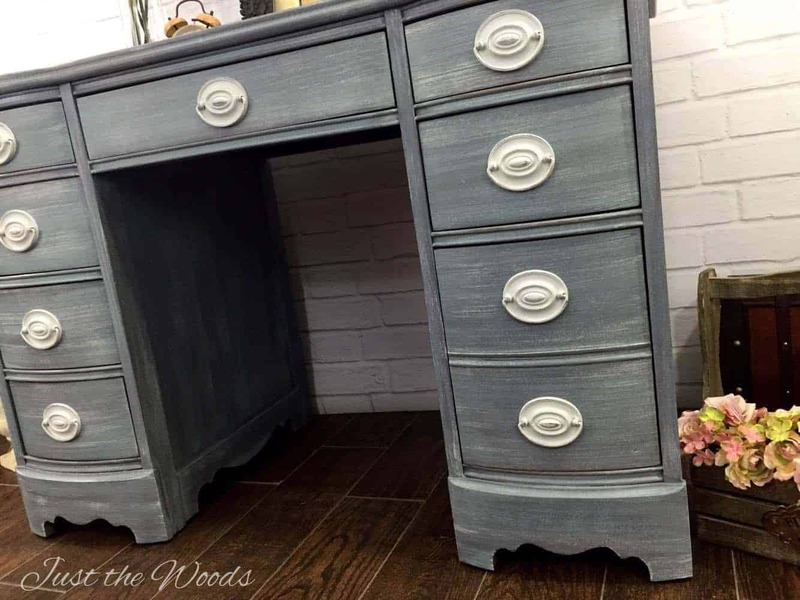 I too find it fun when a piece has “history” like this desk 🙂 Thanks for linking up to #FridaysFurnitureFix! thank you so much!! have a great week! Love this makeover! You did a FABULOUS job! Wish I had this for my own home! 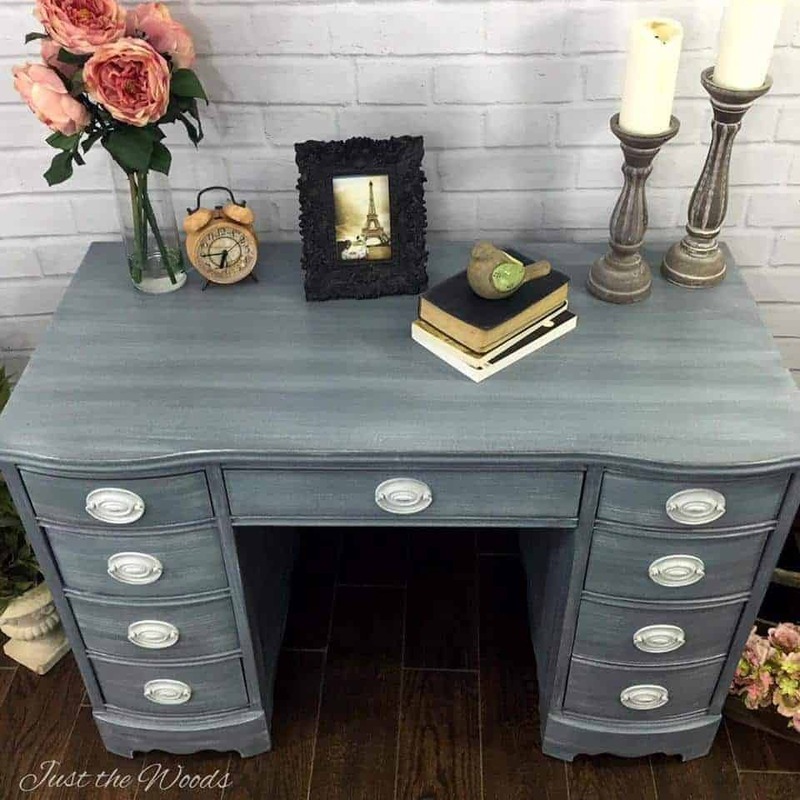 What a gorgeous job you did rescuing this desk. Thanks for sharing! Beautiful! 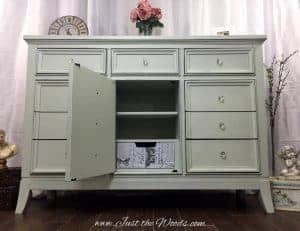 Sharing this evening on the Painted Drawer Link Party and thanks so much for linking up! Beautiful job! I love the white dry brush over the dark gray! What a gorgeous makeover. Your desk looks beautiful. 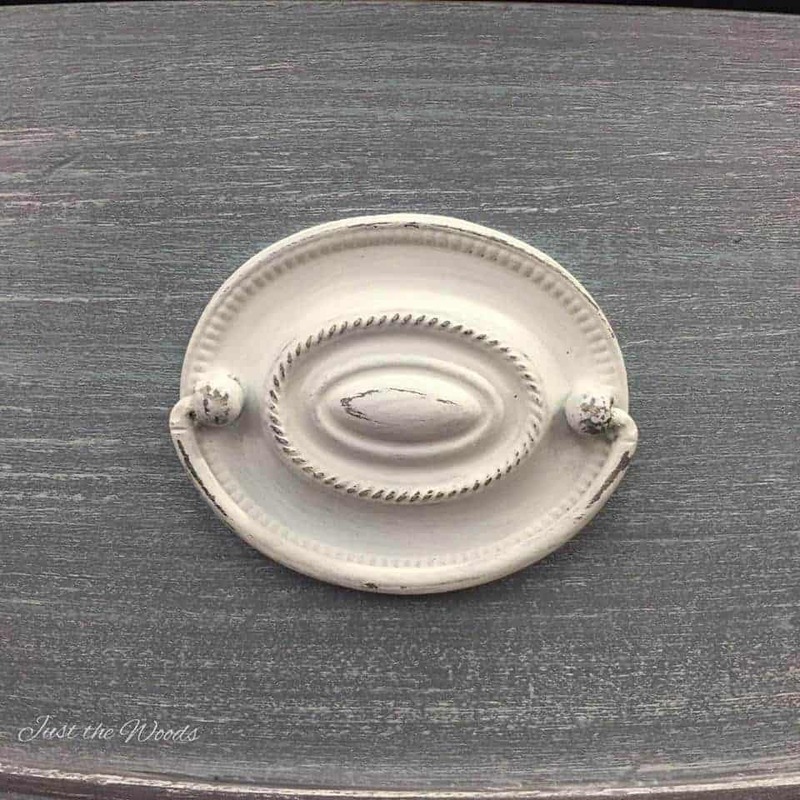 I love the white distressed pulls against the gray. Thanks so much for sharing at Snickerdoodle Sunday. Pinned and Tweeted. We hope to see you at the party today!